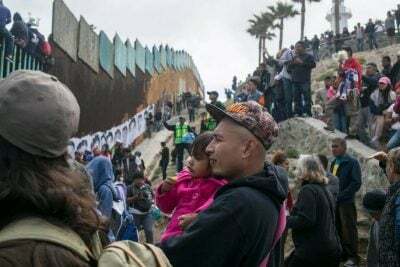 On Sunday November 25th, on the day designated an International Day of Action in Solidarity with the Caravan and Exodus from Central America, US border agents notoriously fired tear gas at families approaching the U.S. – Mexico border at the San Ysidro port of entry. This hostile reception came following a lengthy 4000 kilometre journey starting in the Northern Honduran city of San Pedro Sula. Thousands have been fleeing high levels of violence in the Central American country which has persisted since the 2009 coup d’etat of then President Manuel Zelaya. Grinding poverty, intimidation, corruption, narco-trafficking and political violence have been plaguing communities in Honduras. The country of nine and a quarter million people is now bleeding waves of refugees as their only recourse to a catastrophe. On this week’s Global Research News Hour, we take a closer look at some of the dynamics influencing and impacting the Central American migrants, what the future may hold, and how the situation may be remediated. In the first half hour, guest Tyler Shipley, author of Ottawa and Empire: Canada and the Military Coup in Honduras, outlines the ways in which Canada and Canadian business interests has supported and enabled the very violent living conditions in Honduras from which migrants are fleeing. In our second half hour, independent writer and photojournalist José Luis Granados Ceja reports on his observations of the migrant from his time with them in late October. He describes the narco-trafficking and other dangers the migrants have confronted during their 4000 kilometre journey, his thoughts about the November 25th attack by US border agents, and what he anticipates as a leftist politician, Andrés Manuel López Obrador, assumes the presidency of Mexico on December 1st. Tyler Shipley is professor of culture, society, and commerce at the Humber Institute of Technology and Advanced Learning. He is also an associate fellow with the Centre for Research on Latin America and the Caribbean (CERLAC). His latest book, Ottawa and Empire: Canada and the Military Coup in Honduras (2017) is available from the publisher Between the Lines. José Luis Granados Ceja, is an independent writer and photojournalist based in Mexico City. He previously worked as a staff writer for Telesur and has contributed to the Two Row Times among other outlets. He has also worked in radio as a host and producer, and currently works on a freelance basis. Global Research: José Luis Granados Ceja is an independent writer and photojournalist based in Mexico City. He previously worked as a staff writer for Telesur and has contributed to the Two Row Times among other outlets. He has also worked in radio and as a host and producer and currently works on a freelance basis. José escorted the caravan from the Mexico-Guatemala border to the city of Tapachula in Chiapas and had a chance to speak with several of the participants in the migrant caravan. It’s great to have you on the program José thanks for making the time to speak with us. José Luis Granados Ceja: I’m very happy to be here. GR: Could you talk, first of all, about the encounter at the Mexico Guatemala border at the Ciudad Hidalgo port of entry, the border crossing there? What were the challenges facing the caravan at that point? JLGC: Yeah. The group that I was able to meet with was actually amongst the first wave of migrants coming from Central America into Mexico in order to continue the journey north to where many intend to go, which is the United States. And, well, this is a difficult journey all along the way. It starts out in, you know, most people are coming from Honduras but there were also people from El Salvador and Nicaragua and Guatemala, and it’s a journey that is actually mostly done on foot. Occasionally people do give them rides, or are able to secure some transportation, but for the most part it’s on foot in very hot weather, and with very little resources to speak of. And so what you’re seeing is an exodus of people who are fleeing a very difficult situation. I’m going to mostly talk about Honduras because the vast majority of people are coming from Honduras. It’s a country that is experiencing a lot of political and economic turmoil, and in order to kind of put things into context, in 2009 there was a coup d’etat in Honduras which ousted a left reformer by the name of Manuel Zelaya, and since then, there has been effectively a dictatorship, there have been elections but they’ve been rather dubious. The last one in particular was very questionable, and so the regime in charge in Honduras that is ruling for a very small elite, to the detriment of most people. And so that’s why people are choosing to flee Honduras and endure this journey. In terms of the actual difficulties of the journey, is that, while apart from the difficulty of having to do such a long trip on foot, is also that during those days there was still not a lot of direction coming from the Mexican government. We were still under the government of President Pena Nieto from the PRI party. It seemed like there was a lot of confused signals. What ultimately, what ended happening was that when they got to the border, they were met by a closed gate, and were then, when they tried to cross the first gate from Guatemala and then reach the second gate which is on the actual Mexican side of the border, they were met with repression, with teargas, and so, once that settled down, the border was effectively closed to them, most people decided to cross on very makeshift rafts, and where they were then they gathered in Ciudad Hidalgo where they were received by civil society organizations. You know, I spoke with some people who were attending to the migrants there, and they talked about the exhaustion that many were suffering, you know from the heat, some people had received some confusion as a result of the repression, just to kind of give you an idea. And so that was just the beginning, and so they still had all of Mexico left to cross which again is a very difficult and a very dangerous Journey. Mexico has a problem with security, and there are areas where the State is not very present, and in those areas it’s often here and you do hear cases of migrants being forcibly disappeared by organized crime. Then all of that to get to Tijuana which I think we can get to in a minute. GR: Well could you then first of all talk about some of the stories that you heard from the migrants? Are there are a couple of illustrative stories that you can share that will help them understand what these people are going through on their 4000-kilometre journey? JLGC: Yeah, there’s a couple ones that I think really kind of paint a clear picture. One, I remember speaking to a young man, when we were talking about this exodus, and he out it very plainly, he’s like “we’re not migrating, we’re fleeing.” They are running for their lives. Another young man that I spoke to lifted up his shirt and he showed me the very still very visible scars on his body. They were a result of some thieves who were trying to take his bicycle and shot him 10 times. He barely survived that episode. It gives you an idea of the level of violence that crime employs in Central America. That use, you know, for – to steal something, that, you know, how much value can a bicycle really have? So it gives you an idea just how bad things are, and migrants told me that they feel very hopeless because, so on the one hand they have organized crime groups asking ..through extortion basically, to contribute fees for protection, and on the other side they have police who are similarly squeezing them for bribes. And so even if let’s say someone is able to put together a business, they quickly find out that everything that they are making goes to either organized crime or to corruption. And so, it’s very difficult for people to feel like there’s an exit. One final anecdote that I wanted to share, that I think also helps people understand the desperation, is that, so we have a change of government happening this Saturday December 1st, and the President-Elect, Andres Manuel López Obrador, said that he was interested in offering work visas for people from Central America who were fleeing violence so that they could find asylum here inside of Mexico. And I asked a woman, a mother of three, why she decided to join this caravan and not wait, because at that point it was only a couple of months before there would be changes in government, perhaps a government that maybe would be more friendly towards the needs of migrants, and without a moment’s hesitation, she said immediately, “I can’t wait because my babies will die of hunger.” So that’s how desperate people are feeling, and that I think helps understand. The other part being that they feel that there isn’t a political solution to their problem either. Last year there was election, the one-year anniversary of those contested elections just passed this week in Honduras and people talked about how they took to the streets to protest, that they tried to do things the right way, quote unquote, of agitating, of protesting, of even going out and voting and pursuing a change of government through the democratic institutions of their country, and that too was denied to them, so all of that combined I think is also really why we’re seeing the numbers are people fleeing Central America. GR: And, of course, one aspect is the fact that there is safety in numbers, relative safety in numbers. These people are facing major threats you just hinted at the disappearances and the organized crime and the cartels and so on. Could you elaborate a little more on the, some of those threats that you’re familiar with? JLGC: Yeah, most of the people that I spoke to actually said that they had every intention of leaving their country and heading towards the United States. It was when they heard about this caravan that they decided to join and leave in that moment. And that’s precisely it, because there is safety in numbers. And it’s also a more feasible way of actually doing it. So when you travel alone, generally you do it through the help of what we call coyotajes and for lack of a precise translation, basically human smugglers. And they charge upwards of $7,000 US. That is an amount of money that most people from Central America will never be able to actually save up. It’s an absurd amount of money. I mean it’s a lot of money to people who earn dollars, so it makes it very difficult for them to make it, and without the help of coyotajes you run the risk of taking the wrong route, of being exposed to organized crime groups, of perhaps trying to cross the desert from Mexico into the United States which is also a very dangerous thing. So, there is. There’s strength in numbers when you move together, and it also makes, sends a political message. You know, it’s easy to ignore groups of a couple dozen, or a handful of people, but when thousands of people are moving together, well then, the State institutions inside of Mexico, civil society organizations, the world, I guess, ends up paying more attention to their situation. I think that’s also important because, you know, what it means to mobilization of resources and attention, but unfortunately in some cases a negative attention as we’ve seen as well in the United States. GR: Could you speak to… You also mention the extreme heat that people had to cope with. What kinds of health emergencies is the caravan confronting, and how are they – are people coping with these health emergencies? And also, I think one of the things that was really emotional to see was, at the very beginning of the walk, so they start early try to take advantage of the cooler air in the morning, is that the children are quite happy and they’re playing and they’re running around with other kids, but even the first hour, definitely by the second and then onwards, you can tell that they are becoming very exhausted, and it’s really taking a toll on them. And there’s been some misconception saying that it’s mostly young men…there are a lot of families that are travelling with very young children. There’s even been babies that have been born along the journey. And there isn’t that much services available for them. You know…groups like The Red Cross, that I witnessed being on site, are there, they hand out water, and they provide kind of first aid, but for the more complicated situations, or health situations that arise, there isn’t that much support for them. Fortunately, when they arrived in Mexico City, Mexico City is obviously wealthier and has more resources at its disposal, they set up kind of like a tent city inside an old sports complex, and there they were able to receive medical attention, doctors were able to be on hand and try to address some of the issues that have been developing along the way. GR: I noticed that there was in Mexico City, yeah, you mentioned the people who had, they managed to find some safe haven in Mexico City. I wonder if, briefly, you might be familiar with, it was reported earlier this month about a hundred of the migrants had been kidnapped in Pueblo State on their way to Veracruz, could you provide our listeners with some details about that, how that situation arose and how it became resolved? JLGC: So when they got to the state of Veracruz, they actually were in negotiations with the local state government there in order to get some transportation on buses from the state of Veracruz to Mexico City. Ultimately that kind of support didn’t come through, and people wanted to continue on their journey. And so they started walking. And often when they’re walking, there are good Samaritans who stop and offer to give them rides, but it seems like what happened in this instance is that someone affiliated with an organized crime group offered them transportation but was actually interested in forcibly disappearing them. It’s a phenomenon that is actually unfortunately all too common for the people who are travelling from Central America through Mexico, where they’re scooped up, they’re used effectively as slave labour in order to, for the means for the ends of the organized crime groups. It’s been difficult to ascertain exactly what happened with this group in particular because, you know, they didn’t have cell phones, if they did, they were likely seized by those that kidnapped them. And it’s been difficult to also even know the names of the people who are missing, right? Because this is all in many ways an improvised affair, and so there isn’t like a list of people who are travelling as part of the caravan, it’s difficult to know. So who might have been disappeared, the family members are back in Central America, it’s difficult for them to try to make a petition to the State to try to figure out what happened to their relatives. And so, it’s a consequence of the lack of resources, unfortunately. Although there has been tremendous help that’s been given to them by Mexican civil society, I think in many ways, the lack of transportation that had been promised to them led to this situation. And that’s why you’ve seen so many of the migrant groups advocating for more assistance from the Mexican federal government for their journey, just for questions like that, like safety, maybe having some police accompanying them as much as possible. GR: Okay so you just mentioned that there was, there has been support from the Mexican population. Unfortunately, some of it is sort of an exploitative kind of help. What can you tell us about the overall balance of both support and opposition towards the migrants? JLGC: Yeah it’s difficult for me to say with any kind of certainty exactly, you know, what percentage. I haven’t seen any kind of opinion surveys done on that. I will say that when we were walking from the border to Tapachula, it was really impressive to see that people would literally come rushing, running out of their homes in order to offer people, you know, the food that they had in their pantry or whatever water bottles they happened to have in their home. I remember even seeing some people who are apologizing for not having more to offer. And, you know, the state of Chiapas is also the poorest state in the Mexican Federation, so people who have very little are really interested in giving the little that they have in order to support because, I think as a country, we’re a country that is also, a country that has a lot of people who leave for economic and security reasons. So I think there is a lot of sympathy, for the most part, from Mexican society, for those who are enduring this journey. They know that… they likely have relatives who’ve also had to go to the other side as we say here in Mexico. But I think it’s also important to say that there is racism and xenophobia inside Mexico. We’ve seen displays of that, especially in Tijuana recently with, there was a couple of weeks ago a protest against the migrant caravan, and we saw the mayor of Tijuana make some very troubling statements against the presence of the migrants in that city. I think in some ways, it’s been exaggerated, I don’t mean to play it down, I don’t want to deny that racism and xenophobia exist inside Mexico and that needs to be confronted, but that rally for example, at some point it seems that there are more reporters than there were people demonstrating. Ultimately, it was less than 500 people, but none the less they are very vocal, and if you look on social media there’s also a lot of statements coming from people opposed to the caravan. So there is a mix, but, for the most part, I think even you see groups that have been supporting the migrants. This is a new thing, migrants have been travelling through Mexico to reach the United States for decades and so there’s a lot of organizations that have been working with migrants providing shelter along the way, resources and support. GR: We’re speaking with José Luis Granados Ceja, independent writer and photojournalist based in Mexico City. He’s been following the migrant caravan. José, I wanted you to maybe give us, maybe from your perspective, given what you know about the physical and mental health and trials of the migrant caravan, what’s been going through your mind, having heard about the US border agents firing tear gas at the migrants, in Tijuana near the San Ysidro border crossing? And the other challenges like the protest you just mentioned. JLGC: Yeah, you know seeking asylum, as I mentioned at the beginning people are fleeing, they’re not exaggerated. I think some people try to paint a picture that the migrants are economic migrants, they’re just seeking a better life. But they really are fleeing. There are no jobs, there’s very little hope of change in their countries of origin, and seeking asylum is something that is recognized by both domestic and international law throughout North America – we’re talking Canada, the United States, and Mexico. And so they have a right to seek safety. And it’s really disappointing that people who are fleeing, people who are fleeing danger, are then met with repression. Right? Instead, I would hope that people, that governments, that officials would receive them with open arms, with some compassion, understanding that nobody decides to take this long journey without feeling like they have probably no other choice. And so when you sees scenes like we saw with the tear gas, and then the photos – worse still I think, in some ways, the attempt to justify that, and I don’t think anything can justify that. And also, kind of going to the root of the problem, that desperation that you see people crossing irregularly these border points, is produced by the policies of, in this case the United States government, which actually is deliberately trying to slow the process. So in order to make that asylum claim, you actually have to set foot inside the United States and present yourself to an official and make the asylum, and then you have a hearing, and well, etc etc. So what the US actually has been doing as a means of dissuading people from coming, is making that wait-list extremely long. So even before the caravan got there we were talking about thousands of people who were waiting on the Mexican side of the border in order to be able to set foot, because they only let in about 40 to 50 people in the morning and then another 40 to 50 in the evening. So we’re talking about a very small number of people being processed on a daily basis. And everybody else having to wait. And so that’s that desperation of being in makeshift camps without proper sanitation, without proper access to food and water, you know it makes it so that people feel very frustrated at their circumstance, you know? If the policies were different, that they actually instead of sending troops and barbed wire they sent officials who were able to process things, their claims faster than you wouldn’t see these kinds of clashes happening on the border. GR: Now, this weekend, Saturday December 1st, a new leftist president, Andres Manuel López Obrador , as you mentioned earlier, is taking power in Mexico. He’s promised humane treatment for the migrants, and his incoming interior minister, Olga Sánchez Cordero had fielded the idea of granting 1 million work visas to Central Americans. At the same time there’s a domestic unrest over the migrant issue a long-term, and it could also cause some difficulty and relations with the Trump Administration. So in your view, to what extent will the incoming Obrador Administration be a game-changer for Central American migrants seeking asylum? JLGC: I think if they follow through on that promise to offer visas and asylum or even residency for people from Central America inside Mexico, that could be pretty significant, right? Not – while most people want to reach the United States, I also spoke with many who said specifically that if they were offered asylum inside Mexico that they would happily take it and live and work here. And so that would be pretty important. The challenge I think facing the incoming López Obrador Administration is that there’s a lot of things that are just totally out of control. Mainly the issue that I just touched on previously about the inability for people to actually get into the United States and make their asylum claim. And so there was a proposal that was floated, and then it seemed like there are still negotiations happening, but basically what the Trump Administration is seeking is that people who are seeking asylum in the United States wait inside Mexico. And you know there are issues with that proposal, I’m not an expert on these kinds of topics so I’ll leave that to somebody else, but what I will say is that the de facto situation now is that people are waiting on the Mexican side of the border in order to cross and make their asylum claim. And so that is the challenge of the Mexican government is what to do with these camps that are only growing. I don’t think these kinds of caravans are going to stop anytime soon and so we’re going to have more and more people who are arriving to these makeshift camps who are just, frankly, they are not adequate for people to stay months at a time. Like I mentioned there was the wait-list was already long and that was before the caravan even got there. So now we have over 6,000 new people who arrived to the border region, the US Mexico border region, who are now waiting to cross to be to make their asylum claim. That’s not a sustainable situation. So if they’re able to figure out a way for them to be able to live and work inside Mexico while they wait for the opportunity to go inside the United States to make their asylum claim, I think that would be far more dignified for the asylum seekers because otherwise, you know, there’s waits of an hour, two hours just for a plate of rice and beans right now, right? That doesn’t seem like the kind of situation we want to have happening on the border right now. And then the other the other kind of point of view, even in the last month or so, there’s been at least 11,000 people deported – Central Americans deported from Mexico back to Central America – so the other policy change that one would like to see from this administration, I think would be dropping that enforcement, that heavy enforcement that we’re seeing. So instead of so many deportations because we know that’s the other kind of policy in the United States is basically in a way shifting their border down further south to Mexico-Guatemala, so stopping migrants from ever even coming close to the US border, right? So that would be a positive step forward if we see a reduction in using enforcement and deportation as a means of stopping people from migrating. GR: Okay, finally José, do you have any advice or recommendations for listeners who wish to try to ameliorate the situation for the migrants? JLGC: Migration is generally caused because people feeling like they don’t have any other options in their countries – their home countries or their countries of origin, and that’s essentially a political consideration. The poverty in Central America is the way it is, I think in many ways because of foreign policy by the United States and Canada that has, for example, to speak to Canada, Canada was one of the major forces that helped consolidate the coup d’etat in Honduras. There were negotiations between Canadian officials and the interim government, and then the following government in Honduras trying to facilitate it, because, as we know, in Canada there are a lot of mining companies that are headquartered – mining companies that have interests throughout Central America and Honduras and particular. And so you see Canada as, you know in its diplomatic means, actually undermining the possibility of economic improvement in countries like Honduras, which then further provokes more migration and exodus of people. I would always say that the number one thing is to challenge the foreign policy of your country, in this case Canada, but also United States, and to pressure representatives, in Canada your MPs, to pursue a more humanitarian policy in Central America. Just to add a little point, right, like one of the things that the López Obrador administration has talked about really put the emphasis on, which I think is a correct course of action, is attending to the root causes of migration. Making it so that people who do choose to migrate are really doing it because they want to, but otherwise people have, should have the economic reality so that they can stay in their countries of origin where their families are, where their culture is. I myself emigrated from Mexico with my family to North America when I was very young, and it’s a difficult process. Immigration can be a beautiful thing, and it can really enrich countries, but it’s also, it’s difficult on migrants themselves to come to a new country, so they don’t have to, if they feel like they have a prosperity at home, then I think that’s… everybody wins in that circumstance. GR: José, thank you so much for your time and thanks for sharing your insights with our listeners. JLGC: Thank you very much for having me. GR: We’ve been speaking with Mexico City-based independent journalist, José Luis Granados Ceja.